The PSS silent pistol or MSS "VUL" (or "Wool" in English) is the last completed weapon system resulting from the Soviet development of silent pistols operating on a sealed cartridge system. Two previous designs were considered unacceptable for use due to their limitation to two shots. Earlier systems included the MSP and SP-4M double barreled pistols. Developed around 1980, the PSS was first issued to KGB Spetsnaz in 1983. Intended for assassinations and reconnaissance, it is under production in the special weapons foundry at TsNIITochMash. PSS pistols are still in use by elite special forces units of many nations, as well as by some FSB, MVD. The PSS was developed to give Soviet special forces and secret police an almost completely silent option for covert operations such as reconnaissance and assassinations. The weapon uses a unique cartridge with an internal piston to achieve this end. Otherwise, it is a fairly simple double-action pistol. Few details are known about the pistol's performance, as only a few have entered Western hands. The PSS uses a specially developed 7.62×42mm necked round SP-4 (СП-4), the same as used for the OTs-38 Stechkin silent revolver. The cartridge contains an internal piston and a propelling charge, with the stem of the piston against the base of the bullet. On firing, the piston delivers enough impulse to project the bullet from the barrel to an effective range of 25 meters. The piston then seals the cartridge neck, preventing noise, smoke, or blast from escaping the barrel. The PSS is recoil-operated. In all other respects, the PSS generally follows traditional conventions except for the slide's guide rod, which is located above the barrel and instead of guide rails on the pistol frame. Russia – PSS-2 silenced pistol was developed in Russia. It is based on the original PSS, but has some features of the SR-1M pistol and some improvements. It is uses newly developed SP-16 noiseless 7.62x43 mm ammunition. The PSS-2 was adopted by the Russian FSB security agency in 2011. ^ "Silent pistol from the Russians". Retrieved 10 January 2014. ^ "SP-4" (in Russian). Retrieved 10 January 2014. ^ * Hogg, Ian V.; John Weeks (2000). Military Small Arms of the 20th Century. Krause Publications. ISBN 0-87341-824-7. ^ "Armament of the Georgian Army". Geo-army.ge. Archived from the original on 9 March 2012. Retrieved 1 January 2013. 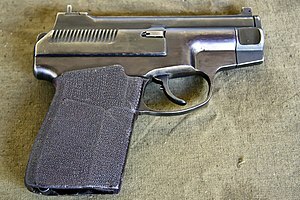 Wikimedia Commons has media related to PSS Silent Pistol. This page was last edited on 27 February 2019, at 11:11 (UTC).